As promised, I actually have something to show today. 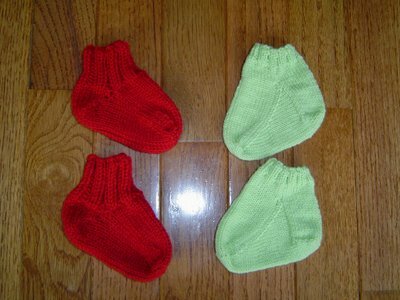 Here are all four of the baby socks. I made the red ones with short row heels and the green ones with heel flaps. I don't know if one style will stay on better or not, I just wanted to experiment. I'm thinking about making some like the red ones for Christmas ornaments or gift decoration. I think it would be a great way to use up those little bits of yarn I always have left over after a pair of socks. I hope to get all this cuteness packaged up and sent out this weekend. Once I finished the gift knitting, I started another pair of socks for me (I didn't want to work on Soleil last night for some reason). 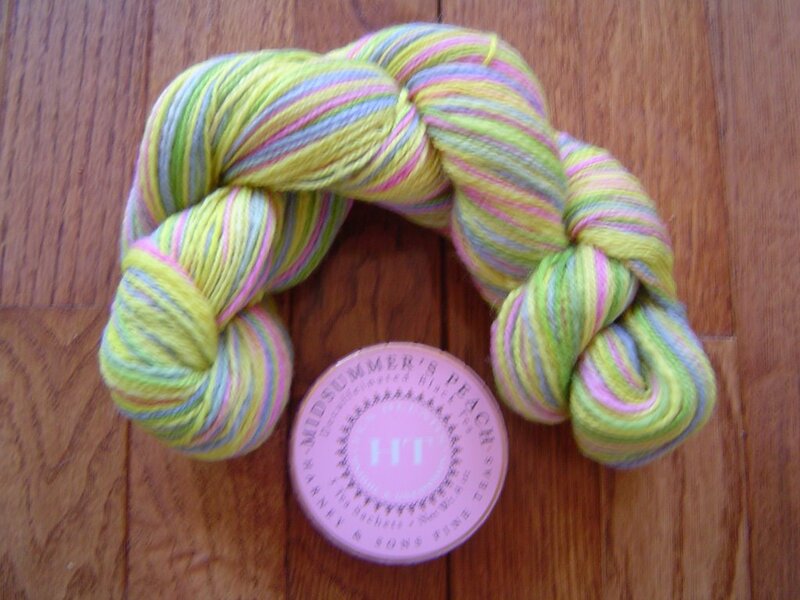 I had been dragging around the Strawberry and Banana Yarn (AKA Pink Lemon yarn) from Sunshine Yarns in my knitting bag ever since I got it but wasn't sure what to do with it. The yarn has short lengths of color and I knew it wouldn't stripe and I was also pretty sure that any kind of stitch pattern would be pretty well lost in the color changes. Last night, right before I started knitting the yarn into a plain stockinette stitch sock (it would have worked but been a bit boring), I realized that Melanie's Twist, the stitch pattern that Regina invented for me had to be used on this yarn. So, here's what I have so far: The twist pattern isn't as obvious as it is on my Sockapaloooza socks that she knit for me, but check out those chevrons! I love the way the random color spots are tilting up and down. This stitch pattern is working wonderfully in this yarn. I can't wait to see what these socks look like finished. 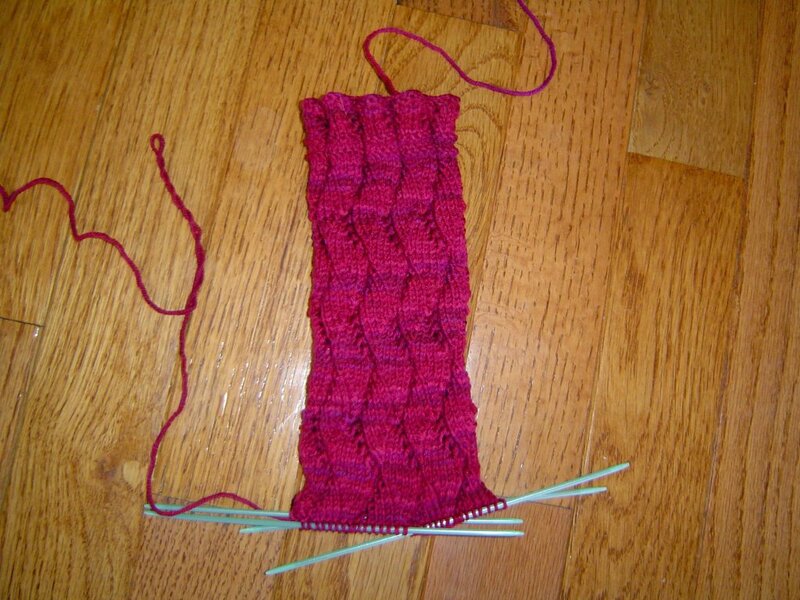 As soon as I post this entry to the blog, I'll try to make a link to the Melanie's Twist Stitch pattern in the sidebar. Thanks again Regina for such a great stitch pattern! I have nothing to show today. I didn't knit a single stitch yesterday, didn't spin, didn't do anything fiber related. Normally this would be the cue for a picture of Ramius. Ramius however, is getting his breakfast nap (not to be confused with his mid morning lie down - that comes next) and gave me a dirty look when I showed up with the camera. So this morning, I have no knitting and no cat. What I do have, however is the stunt cat. This is Post Office. 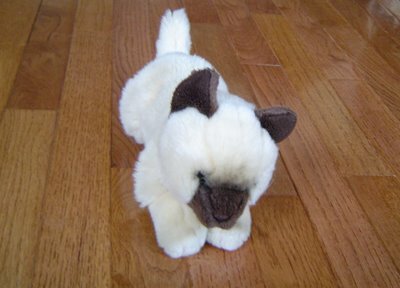 He is Caleb's (also named by Caleb) but he volunteered to fill in as a stunt cat for the blog this morning. So, without further ado, I give you Post Office, the official Pink Lemon Twist Stunt Cat... Those of you who haven't just quit reading my blog forever will be rewarded with something fibery tomorrow, even if I have to stay up really late! This weekend I got a little bit of knitting done. Or maybe I should say I knit several little bits. These are for baby Allen (my sister in law's sister's baby boy) who is supposed to arrive in about 5-6 weeks. 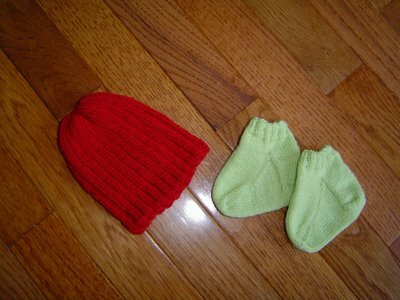 The green socks are in Dale Baby Ull and the red hat is knit in Wool Gatto. I am making some little red socks to match the hat, because you're really never too young to accessorize. Both yarns are superwash wool and very soft (Dalese, if you're reading this, it means you can just toss it into the washing machine). I'm trying to get everything together to send in the next week. I think the sizing on these is about 6 months or so (I figure all babies have oodles of stuff for when they're first born, but they don't get as much when they're a little bigger) but of course that will depend on how fast he grows. That's the great thing about knitting for babies - you can make stuff big and they'll grow into it eventually! 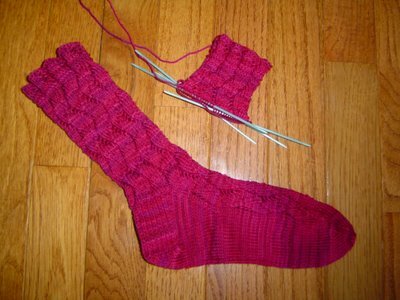 I finished my Raspberry Lace socks! I really liked this pattern - its pretty and its easy to memorize, so once I got it going, I could knit it without looking at the pattern chart. The details: Tess Yarn's sock yarn - not sure of the color, size 1 US needles, using the Waving Lace Socks patter from IK Spring 2004. I really enjoyed working with this yarn. I'd never used it before and I'm glad I have two more skeins of it. It really reminds me of Lorna's Laces, but its slightly cheaper ($15 a big skein = 1 pair of socks versus $19.00 for two small skeins = 1 pair of socks). 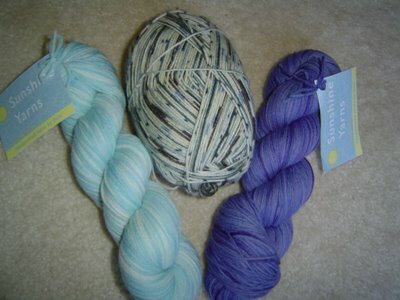 I don't know if both companies start with the same yarn before dyeing, but the two yarns are definitely similar. In family news, yesterday was Caleb's last day of preschool. He loves school so much and I really hope that he holds on to that love of school as he gets older. He's sad that the school year is over, but these last few weeks have felt like there have been so many school activities, that there hasn't been time for much else. I'm looking forward to some lazy summer days - but first I've got to get my house clean! I hope you all have a great weekend. The second Raspberry Waving Lace sock is marching right along thanks to some knitting time during American Idol and House last night. I'm ready to start the heel turn now. For some reason, by the time I get the gusset stitches decreased out, I feel like I'm almost done anyway so I might as well finish - I think this might be part of the reason I'm knitting socks so quickly. Thanks for all the info on the Crocs. I think I'll check into a pair soon. Ironically, Crocs were one of yesterday's topics on the Townsend Socks. Apparently a number of people have been emailing Crocs about making a clear pair for the socks to show through. That would be pretty great! The new project for Sew? I Knit was announced: a top! I'll have to look in my pattern stash to see if I have anything that I want to make. I'm pretty sure I have some fabric (my great ginormous fabric stash has to have something!) so I'm off to stash dive. No blogging tomorrow, but I'll be back Friday! I did get some knitting done over the weekend and even a little bit yesterday! (Monday is always crazy around here because that's the day I run most of our errands and do chores around the house.) As you can see, I've finished the first of the raspberry Waving Lace socks. 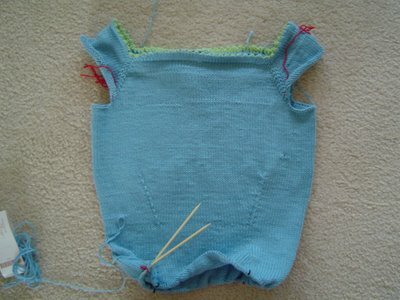 The stitch pattern is pretty easy to memorize which makes it a portable project. I've just begun on the cuff of the second sock, but hope to get more done today. I also started a new project this weekend - its not as portable. This is Soleil from last Spring's Knitty. 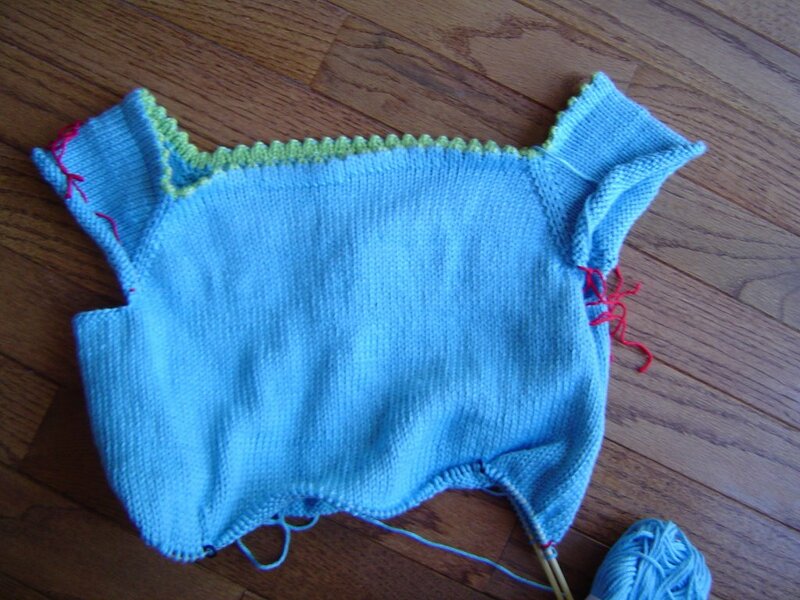 I'm knitting it in Knit Picks Shine Sport in Aquamarine and its moving along pretty quickly. I'm past the decreases for the waist shaping right now. I love the color of the yarn and I think it will be a comfortable and cool top to wear for summer. 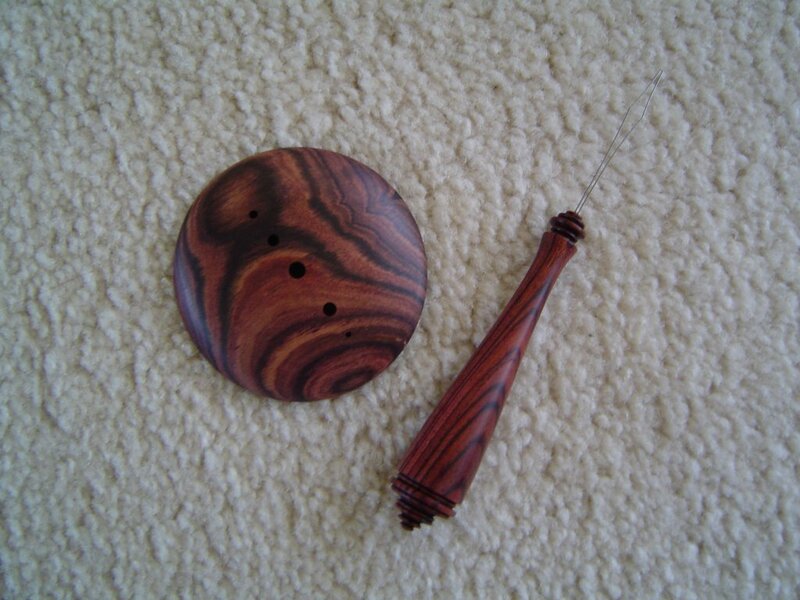 I got a pair of metal needles (Susan Bates Silvalume's) to knit this because the only circular size 4 I had was a Balene II. I discovered while I was knitting Picovoli a couple of weeks ago that the yarn was a little grippy on those needles and I felt like I spent all my time moving the stitches around the needles. The metal needles are a definite improvement! On a completely non-fiber related note, how many of you have Crocs shoes? Do you like them? Do you wear them? Where do you wear them? For some reason I like them, but I haven't tried them on yet because I'm not sure where I'll wear them. What do you guys think? Saturday was a great day for mail and my stash is glowing! First, some more sock yarn from Sunshine Yarns. On the left is Seabreeze and on the right is Lilacs, one of Dani's new Not So Solids (I love this type of yarn, it totally looks handdyed, but the color is solid enough that you don't loose any stitch patterns in the yarn pattern). In the middle is some Opal that she was destashing. The ball band had apparently wandered off, but it was a great price and I thought since I'd never knit with Opal before this would be a great way to try it out. Caleb has already claimed it for his own socks. The second thing that came was what can only be called a Major Stash Score. If you're not already sitting down, sit and give it a moment of silence: Yes, you see correctly. 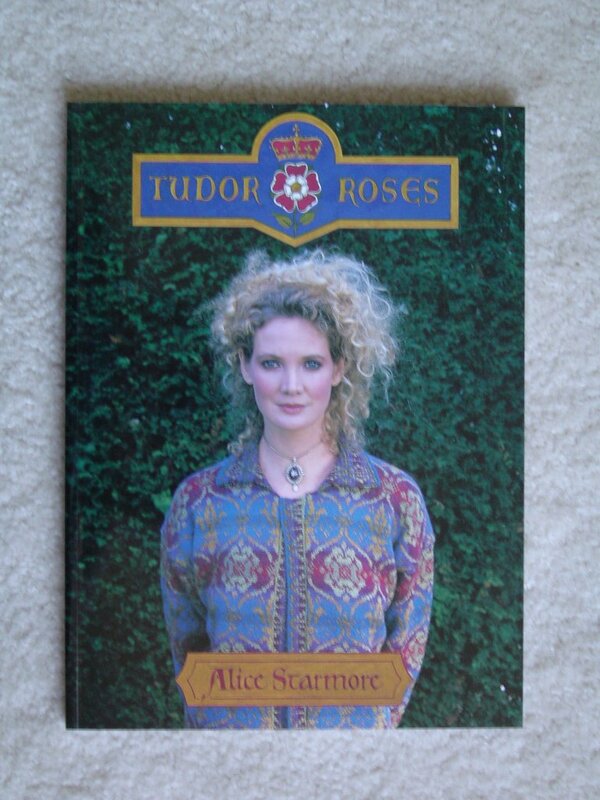 I got Alice Starmore's Tudor Roses! Its brand new, never been opened (until I got it) and its just glorious! I had checked it out from the library a month or so ago using interlibrary loan (borrowed from the Denver public library) and it was really hard to return it to the library. I just kept wanting to read it and study it more and let me tell you, the designs are amazing! So last week, I was wandering around the Internet and I found it! 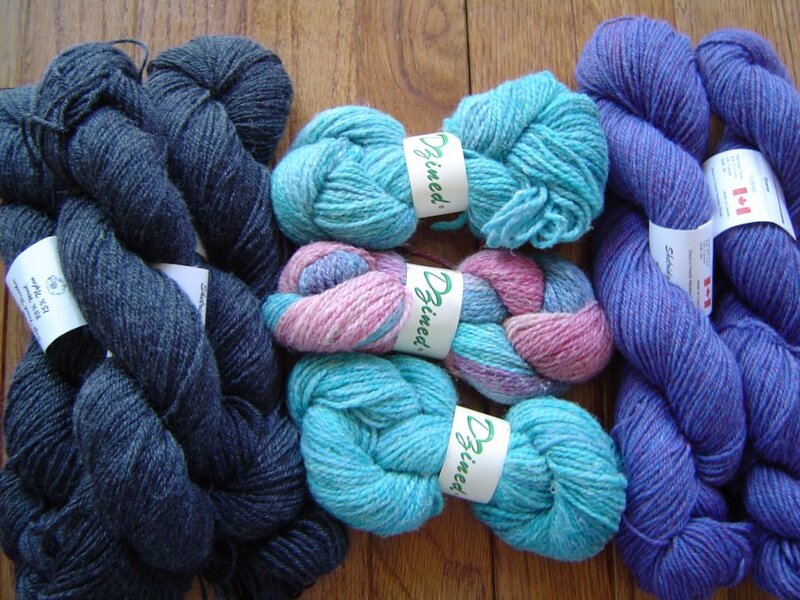 If you've never been to Janette's Rare Yarns, you should go check it out. In addition to occasionally having a brand new Alice Starmore book (WooHoo! ), she carries Rowan, Jaeger, Debbie Bliss, and Noro yarns at really great prices. 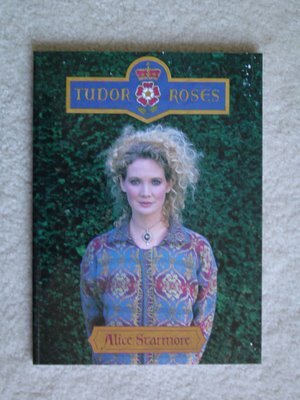 Her shipping is reasonably priced (she's in the UK) and very fast - I ordered the book on Monday or Tuesday and had it here Saturday. Even though this has been a busy week for us, I have gotten a little bit of knitting done. This is the Waving Lace Sock from IK Spring 2004. 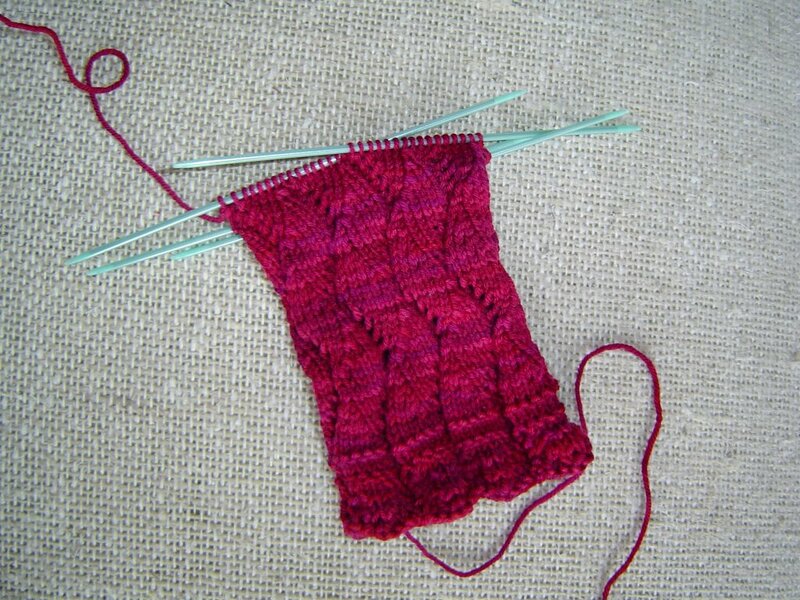 I'm knitting them with a wonderful raspberry colored handdyed sock yarn from Tess Yarns. This yarn reminds me of Lorna's Laces Shepard Sock, but I haven't actually played with the yarns side by side. I am just in love with this color - its slightly darker in real life than it photographed, but you can see the range of tones it has. 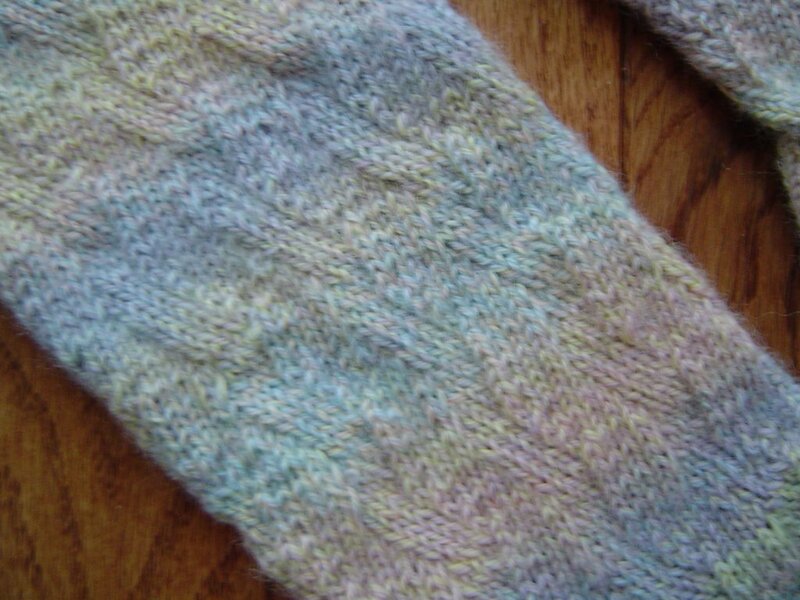 I love knitting with the hand dyed "solid" types of yarn because they are so much more interesting than a flat, commercial solid, but they don't camouflage the stitch pattern either. That's it for now, I'll be back when I have something interesting to show - like a heel flap! One nice thing about having your schedule get crazy, you can still knit small projects! 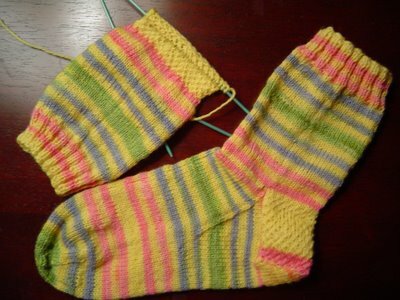 Of course at Pink Lemon Twist, small projects refers to socks and yesterday I finished knitting my Taffy Stripes socks. To recap, the yarn was handspun by my Sockapaloooza Sock Pal Regina, then she handdyed it so it would be self striping. I love the way these socks came out. 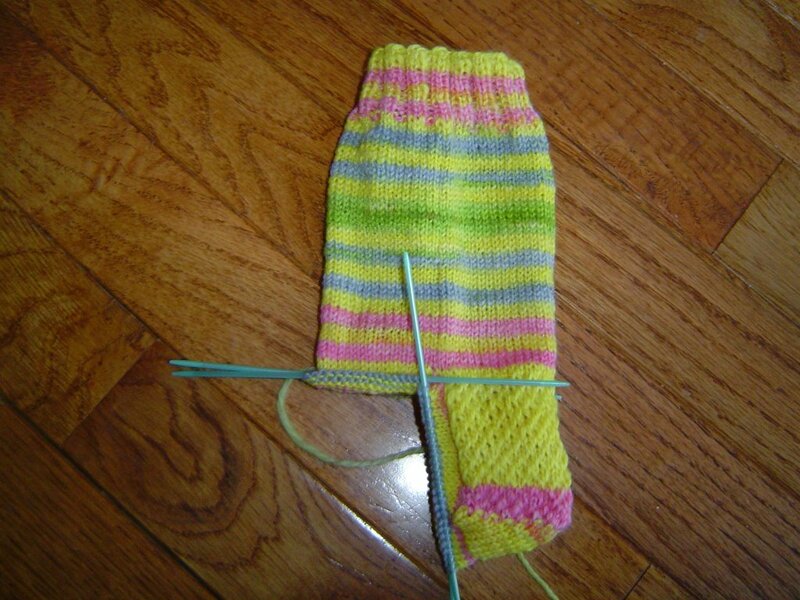 As you can see, I was able to get the socks to match until somewhere around the heel, then things started changing. For some reason, it really cracks me up that the part of the sock that will be hidden in my shoe decided to do its own thing and not match, while the top parts, the parts the world will see, match perfectly. Thank you again, Regina for such a wonderful Sockapaloooza experience. I can't wait to sign up for Sockapaloooza 4! On a completely non knitting/spinning/fibery note, I have to talk about groundhogs today. I love groundhogs. I don't know why, just that they're cute, fuzzy, and look like something that you could really hug on - right up until it freaks out and rips your head off - this is why I haven't tried hugging on one. There is a ground hog that lives near the park and rec department here and I see him some afternoons as I'm running errands. For some reason they like to munch on weeds next to roads so you can see them when you drive (mostly they do stay out of the road - which is good). I don't think we had groundhogs in the South or if we did, they didn't hang out near the roads the way the Virginia groundhogs do. I love that such a cute animal has its own holiday too and really isn't Groundhog Day the kind of holiday that everyone can celebrate? No matter what your religion, political stance, race, socioeconomic level, or feelings about acrylic yarn, you can get behind Groundhog Day. I mean, seriously, what's not to love about an animal who can do all that and looks cute eating weeds by the roadside? I finished the first sock from my custom spun and dyed yarn and have a good bit done on the second sock. 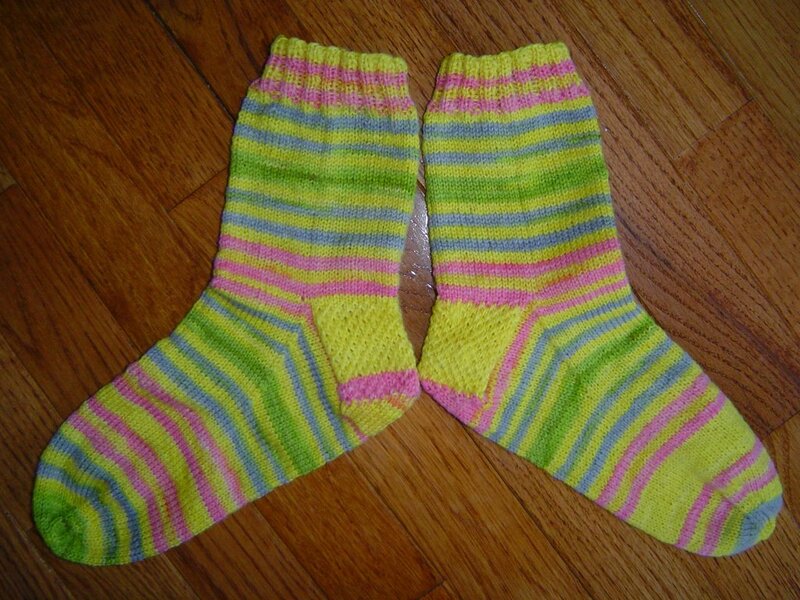 I've realized that these socks remind me of taffy so I'm kind of calling them my Taffy Stripes Socks. When I finished the first sock, I had to roll some yarn off of the ball so I could start at the same place in the stripe sequence on the second sock and I think I did a pretty good job of it. I was afraid that I might make sock brothers rather than twins which would be a shame on this yarn since its so perfectly dyed, but I seem to have figured out how to make sock twins! I also wanted to mention that over the next two weeks I might not be able to blog every weekday morning because of a combination of some personal stuff and Caleb's End of the School Year activities. I'll blog when I have a chance and when I have something to show you, but don't worry if you don't see fresh blog posts. Everything is great here, but life will be getting busy for us and blogging and knitting/spinning time will be minimal for a little bit. Regina, Sockapaloooza Pal Extraordinaire, has OK'd me sharing "Melanie's Twist" with everyone, so the directions are below. This stitch pattern has an 8 stitch repeat and is 12 rows/rounds long. Round 1 and all odd numbered rounds: Knit. Rounds 2, 4, and 6: *K3, K2tog, K3, inc 1, rep from * to end of round. Rounds 8, 10, 12: *Inc 1, K3, K2tog, K3, rep from * to end of round. Note that these directions are for knitting in the round. 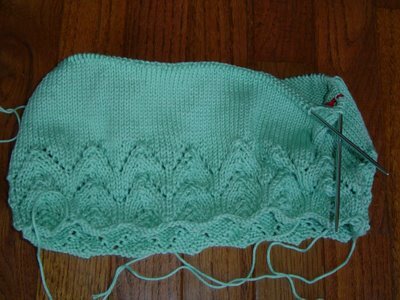 If you wanted to do this stitch pattern in flat knitting, just make the odd numbered pattern rows your WS rows and purl them. If you want to make a pair of socks similar to mine, just find a basic sock pattern with a stitch count that is divisible by 8 and plug in the stitch pattern. I've also started knitting on the handspun and handdyed yarn Regina sent me. This is the first sock, but this is the second time I've knitted the first sock. I originally started with a Feather and Fan variation and while I liked the way the pattern made the stripes all scallopy and lacey, I really fell in love with the plain stockinette in the gusset and on the sole of the sock (yes, I knit the cuff, did the heel flap and gusset and then changed my mind), so I frogged the sock and started over. I think plain stockinette really shows off the stripes better. Thanks so much Regina for a really great Sockapaloooza gift! I finally got a picture of my finished Picovoli yesterday. The details: Grumperina's Picovoli pattern from MagKnits with the picot hems, knit in KnitPicks Shine Sport (5 skeins of Sky and one of Green Apple). I really cannot express how much I love the way this top fits. The shaping is exactly in the right places and its so comfortable to wear. I've already washed it - in the washing machine just like the yarn ball label says to - they weren't kidding, and I didn't have any trouble with size changes. I'll definitely be wearing this one a lot during the summer. Yesterday I also got a tiny bit of Smiley's fleece combed. 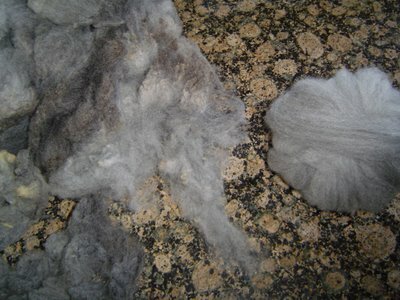 On the left you can see the washed fleece and the range of grey's it has, and on the right is 1-1/4 ounces of combed wool. I am loving how soft this fleece is and finding very little VM in it. I'm thinking Smiley was coated because of the low VM in his/her fleece. When I comb, I make a little pile of the combing waste and when I weighed that, it was only 1/8 ounce! The color in the picture is pretty accurate too, I'm getting a nice clear silvery grey top with no yellow or brown tones. Its the perfect shade of grey! Sorry about the delay in posting, I couldn't get Blogger to load pictures yesterday - and this post needs some pictures! We went Saturday and had a wonderful time. The weather was sunny and breezy and the barns weren't too hot to shop in. I took my camera but I got no pictures while I was there - I think it was the wool fumes. I did meet some other bloggers while I was there. I ran into Nanc from Toys Are Good Food at The Fold's booth and she pointed out Good Girl Purl from The Purling P's and 200Sox. Then I ran into Alison at Alianne Knits, several times actually in the Main Barn. As far as purchases, here goes: I picked up some yarn for socks (shocking isn't it) On the left is Charcoal Soft Touch Heather from Shelridge Farms. In the middle are some tiny skeins of a wool and hemp blend from DZined, and some Crocus Soft Touch Heather, also from Shelridge Farms. More sock yarn: Socks that Rock in Lover's Leap on the left, 3 skeins of Tess Yarns sock yarn in the center, and Socks that Rock in Chapman Springs on the right. I got the Socks that Rock from Toni at The Fold and it was one of the first booths we stopped at. It turns out that was a good thing because all 800 skeins she brought to the show were sold out by 10:30 AM - On Saturday! This is a diz and threader set made of Kingwood that I got from The Woodchuck. Kingwood is part of the Rosewood family and I'm a huge fan of Rosewood. I mean its wood with pink tones - what's not to love? And now we reach the spinning fiber portion of our purchases. 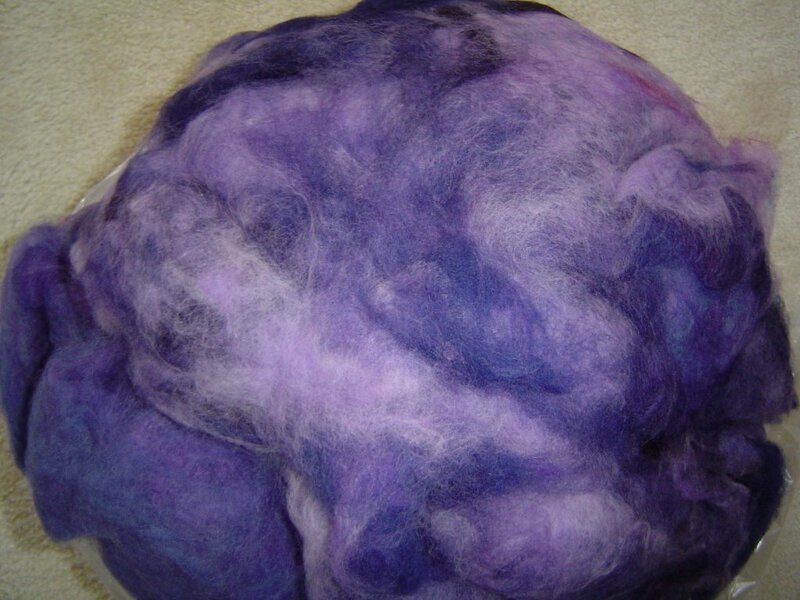 This glorious purple mass is wool and mohair from Spinner's Hill. I got two pounds of it. It will be a sweater (and possibly a shawl, socks, mittens, and various other things - 2 pounds goes a long way). YUM. That's all I have to say about that. This is also spinning fiber - interestingly enough, both are 8 ounces of fiber. 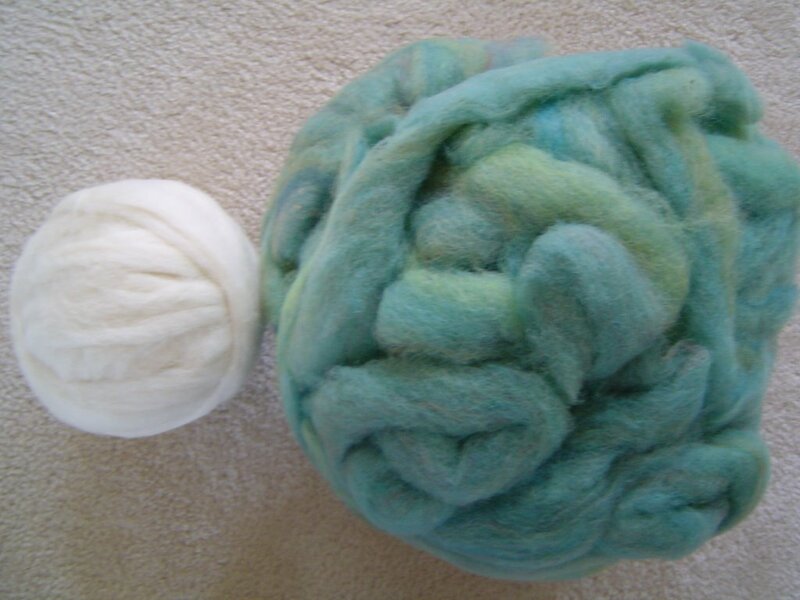 On the left is a merino/hemp blend from DZined. I saw and felt her yarns last year and fell in love with the softness and drape of this blend, but didn't buy any then. This year I made sure to stop at her booth! On the right is a wool/mohair blend but I can't remember what booth I got it from. 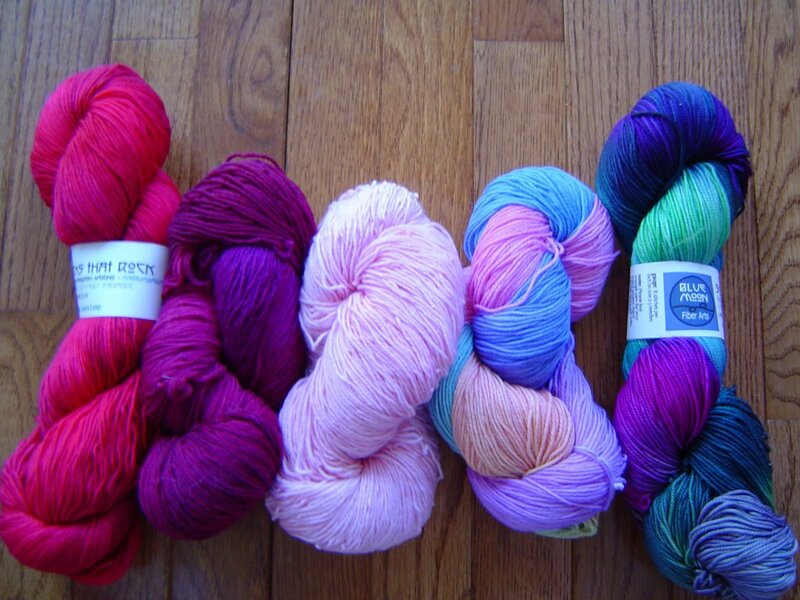 It will be sock yarn. Finally, this is a raw fleece. 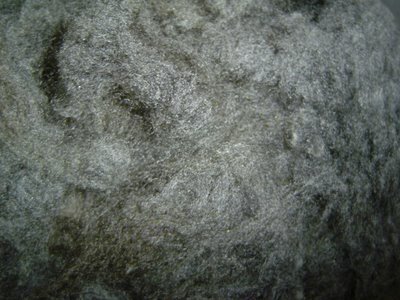 Its the first raw fleece I've ever purchased and I just love it. Its 5.25 pounds of Corridale from a sheep named Smiley! I've already washed it and its spread out in my bathtub (Mickael thinks it looks like I killed a Wookie). The color of the fleece is grey and it goes from pale silvery grey all the way to an almost charcoal grey. I haven't weighed it again after washing it (its not quite dry) so I don't know how much lanolin I washed out, but I just love the softness and the color of this fleece. This pretty much sums up how Maryland went. When we dragged ourselves back home, we were all tired, but pleased with how the day had gone (Mickael and Caleb spent the day eating Fair Food - yum!) It was fun to meet some fellow bloggers and I got lots of complements on both Picovoli and the sheep bag. Its always fun to spend the day with other people who are as crazy as you are! Sockapalooza Package - OH MY! On Friday, a small box appeared on my front porch. What was in the box? It was my socks from my Sockapaloooza Pal, Regina, and you'd better sit down because it was incredible. First there were the socks which you see above. Aren't they gorgeous? They are knit from Trekking XXL with a star toe and a stockinette heel flap. They fit perfectly and I couldn't be happier with them. There was a letter in the box from my sock pal and (are you ready for this?) she made the stitch pattern up just for me! That's right - I have my own stitch pattern now! Named Melanie's Twist, here is a close up: Isn't it amazing? I can't wait to try it out. OK, take a deep breath and get ready for the rest of the package... At the top is sock yarn and below it is a cute little box of tea - I love tea, I'm going to go make a pot of tea as soon as I finish up here, yeah tea! The yarn - sit down again for this one- was handspun by Regina from superwash wool and as if that wasn't enough, she then dyed it to make it self striping! In her letter she sent pictures of the yarn in process and while I have never dyed self striping yarn before, apparently it involves a warping board to get it ready and then it gets draped all over your bathroom to dry - seriously, if I had a scanner, I'd show you the pictures. I am still in shock at this gift. I spent most of Friday walking around with the socks showing everyone in the family (Mickael still doesn't get it, Caleb said, "That's nice Mommy," and Ramius purred. My Mom understands though and she thinks they're gorgeous too.) 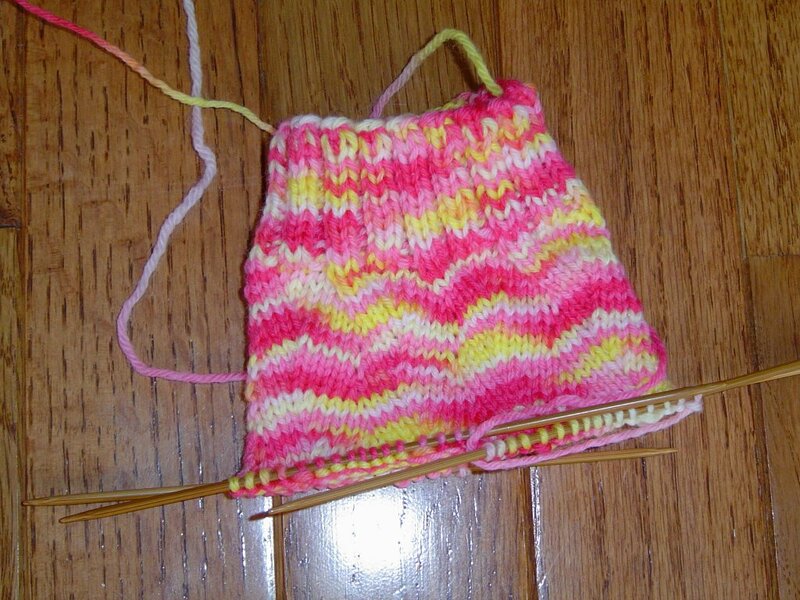 I've already cast on with the sock yarn and it is striping nicely (you can see the sock later this week). Regina, thank you so much for everything. I'm so excited about it all, I feel like a puppy at a carnival. I tried to email you at the email address you sent, but the emails keep bouncing back at me. Thank you, Thank you, Thank you! I can't wait to do Sockapaloooza again! Picovoli is 98% done! I will have something to wear tomorrow. Last night I finished knitting the body of it and got the hem stitched down so I was able to finally try it on and it does fit. All I have to do today is knit the hems onto the sleeves and stitch them down, do some weaving in of ends and give the whole thing a big steamy blocking with the iron and I'll be ready to go! They've taken the rain out of the forecast and it looks like it will be a bit warmer than they originally thought, so Picovoli might not have to spend the whole day under a jacket. If you see me wearing this and carrying the lamb bag, please say hi! Where will I be tomorrow? What kind of things am I looking for? I'll tell you. I will be shopping for sock yarn (naturally) from Tess Designer Yarns, Shelridge Farms, Cherry Tree Hill and The Fold - I've got to check out Socks That Rock. I plan on getting a fleece. I have no idea what kind, but hopefully one will speak to me. I'll be buying spinning fiber from Spinner's Hill, Kid Hollow Farm, and anywhere else that jumps out at me. Those of you that are Spindler's, I will be at the meet up at the Journey Wheel booth too. I'd love to meet any of you who are going tomorrow. For all of you that can't go, try to have a good weekend anyway - I'll be back Monday with all the goodies. UPDATE: The top is finished and ready to go, but MDS&W blogging has been pre-empted - I just got my goodies from my Secret Sockapaloooza Pal and WOWIE! These totally get Monday all to themselves! UPDATE II: Regina, I tried to email you, but the email address you gave in your letter is bouncing back at me - as you can see from the first Update, the package arrived safely and I'm thrilled. Well, yesterday my Sockapaloooza pal got her box of goodies. Who is she, you ask? Its Jennifer over at Knittysticks. She seems to like everything, including the socks, so I guess I was worrying for nothing. If you read the comments yesterday, you saw that my socks have been sent so now I'll be camping out by the mailbox waiting for them. I would definitely do Sockapaloooza again - even without seeing my socks - it was just fun figuring out what kind of socks to make for someone I had never met. In Picovoli news, I am to the increases below the waist. Then I have 1 -1/2 inches of knitting straight and I do my lower hem. 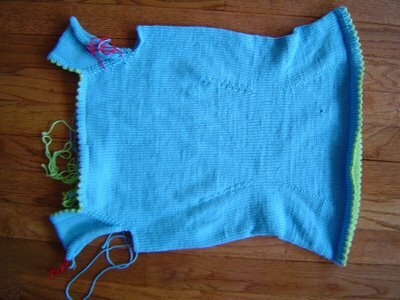 I'm hoping to finish the knitting today so I can do hems and finishing tomorrow. I do still hope to wear this to MDS&W, but its looking like it might be under a jacket since its supposed to be cool and rainy. Mom has assured me that the lamb bag will be fine in the rain. 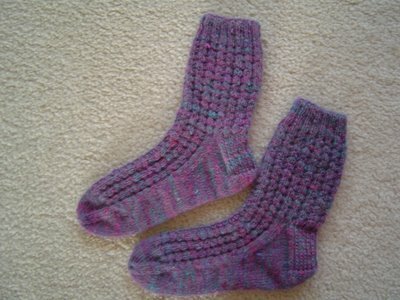 I have finished my twelfth pair of socks for 2006! Yes folks, the waffles are done. The details for those that care: handspun yarn (roving from Kid Hollow Farm in the Loganberry colorway), knit on size 1.5 US needles (2.5 mm? I think), using the stitch pattern from the Blueberry Waffle socks. I loved this stitch pattern and the way it works up. The socks are squishy and should be nice and warm. I still have a decent amount of yarn left over and I should have enough for a third pair if I add another color for heels and toes as my mom suggested (actually she suggested that I give the yarn to her, but I suggested that she get her own roving and spin herself some socks). Yesterday was a big day for the Post Office and they don't even know it. I sent my Sockapaloooza socks off on their long journey...to Maryland. Yes, that's right, my Sockapaloooza pal is in Maryland. I will reveal her identity when I know she has the socks (which should be today). I hope she likes everything - I have my knitting needles crossed that she will! Unfortunately for the Caribbean Sea Monster, but fortunately for me, Picovoli is starting to look like a top. I've started the waist decreases and I've stitched down the hem on the neckline. I'm going to sew in more ends today, just to keep them from getting out of hand. Its still looking good for me getting it finished by Saturday. I'm probably around the halfway point on it but I'll still have to do hems and sew them down on the sleevelets and the bottom edge. The photo doesn't really show the neckline picot edge so you'll have to take my word for it, but I love the little Green Apple picots showing at the edge. I'm still on gauge (checking periodically since I don't have time to frog) so hopefully it will fit. I'm making my list for Maryland and I'll share later this week, but what are you looking for? On Saturday my Mom flew in to town. She has never been to MDS&W before so this will be her first year. She brought me this bag. Isn't it cute? She figured it out and made the pattern herself. 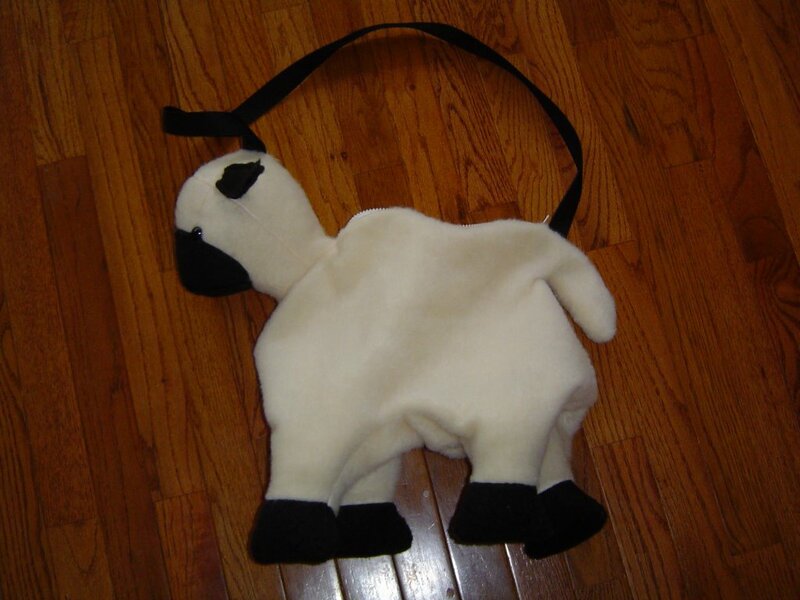 There is a zipper on the lamb's back. I'm really thinking this will be the bag I carry at Maryland this year. Thanks Mom! I love it! I'll be back tomorrow with pictures of what I did this weekend, and yes, I did actually get some knitting done.